The treatment or management of tooth wear with composite resins can be challenging because significant alterations in the patient's occlusion are usually required. Comprehensive approaches include the use of facebows, articulator-mounted casts, laboratory-made wax-ups, and silicone indexes to deliver the restorations. Even though this sequence of steps is recommended, in many cases it is not applied. The reason for this is related to the complexity and time required for these steps, which are normally applied in indirect restorations like ceramics but not properly used in direct composite resin rehabilitations. Moreover, a large portion of these patients, clinicians, and technicians in many countries may not have the resources and/or tools to undertake a full comprehensive approach. In order to aid clinicians to use an exclusively direct method to manage these patients for whatever reasons, the authors propose in this article a thought process applied to diagnosis and treatment planning that allows the restoration of extensively worn dentitions in a logical clinical sequence. The first goal is to provide a clear and organized vision of the functional, biologic, and esthetic principles of treatment planning based on the most current, evidence-based notions and clarified insights from experts. These are principles that should be applied universally in any comprehensive treatment plan. The second goal is to propose the application of these principles to direct restorations even when no individualized articulator mounting or appropriate laboratory wax-ups are available - the anatomically driven direct approach (ADA). Since the first introduction of the Cerec system (Sirona) in the early 1980s, the use of computer-aided design/computer-aided manufacture (CAD/CAM) technology has spread widely in modern adhesive dentistry. Thanks to this innovative technology, it has been possible to carry out chairside restorations fully managed by the clinician, with the advantages of lower costs for the patient, more rapid execution of the restorations, and the exclusion of the provisional phase. With further improvements in chairside technologies and materials, specifically in the field of composite resin blocks, it is now possible to fabricate multiple ultrathin, minimally invasive or even noninvasive restorations in one single appointment. The clinical case presented here was solved using an innovative approach: It was entirely studied and realized chairside by a dentist on a computer, without any plaster cast or classic articulator. Vertical dimension of occlusion (VDO) augmentation was projected with the 'Incisal Tip' tool on the virtual articulator of the Cerec system. Eight composite resin overlays were designed on the non-prepared posterior teeth of a patient suffering from generalized tooth loss principally caused by a history of bulimia nervosa. The maxillary anterior teeth were restored with six palatal veneers modified with direct composites from the vestibular side, in order to improve the esthetic integration of the restorations. The mandibular posterior teeth were built up with direct composites. Demographers agree that the so-called elderly population will increase steadily in the future. Not only will their numbers increase, but they will live to an older age. In the case of fully edentulous patients, implant treatment is a possibility, but for many, rehabilitation by means of full removable dentures is still the preferred option. In recent decades, computer-aided design/computer-aided manufacturing (CAD/CAM) has brought about what can only be described as a revolution in dental offices and dental laboratories. CAD/CAM has many areas of application, and these are constantly increasing. In response to the growing demand from users, CAD/CAM can now produce sets of complete removable dentures using a virtual design and fabrication process. A protocol for a new CAD/CAM-supported method is presented here in a clinical case report. Laboratory procedures are simplified because a number of the conventional steps have now disappeared. Today, it is possible to design the shape of the teeth for each patient, which results in a better customization of the dentures. Combined with appropriate staining of the teeth and denture base, this method produces full removable dentures that integrate very well into the patient's face to ensure a good esthetic result. Purpose: The aim of this study was to evaluate the effect of preheating composite resins used as luting agents for indirect restorations on microtensile bond strength (µTBS) and adhesive interfaces. Material and methods: Fifty sound extracted third molars were used. Ten experimental groups were formed with three different luting agents: one resin cement (RelyX ARC) and two composite resins (Venus and Z250 XT). The composite resins were tested both at room temperature and when preheated to 64°C. Restoration depth was tested using 2 or 4 mm-height indirect composite resin restorations, previously made on cylindrical molds. Adhesive and luting procedures were done under simulated pulpal pressure. After luting, the teeth were sectioned into beams with a cross-sectional area of 1 mm2 at the bonded interface, and tested in tension at 0.5 mm/min. The characteristics of the adhesive interfaces were observed under scanning electron microscopy (SEM). The µTBS data were analyzed using ANOVA and the Tukey test (α = 0.05). Results: When luting 2 mm restorations, the composite resin Z250 XT, preheated or at room temperature, achieved significantly higher µTBS than did RelyX ARC. At this depth, Venus did not differ from the resin cement, and with the 4 mm restorations, only preheated Venus presented significantly higher µTBS than RelyX ARC. Preheating the composite resin resulted in thinner luting interfaces, with a more intimate interaction between luting agent and adhesive layer. Conclusion: Preheating composite resin for luting procedures may not improve µTBS, although it could be used to reduce material viscosity and improve restoration setting. Aim: Color matching of the restoration to the adjacent teeth can be difficult due to the translucency of the ceramic and the visual exposure of the polymerized resin cement through the ceramic material. The aim of this study was to identify color differences between try-in pastes and the corresponding luting resin composites. Materials and methods: The materials tested were Variolink Veneer, Variolink Try-In, Variolink Esthetic LC, and Variolink Esthetic Try-In. Blocks of IPS e.max CAD were bisected along the vertical axis, producing specimens of different thicknesses. The surfaces to be evaluated were finely polished with a metallographic machine using 6000 grit SiC paper. The IPS e.max CAD specimens cemented with resin cement or with the try-in pastes were superimposed on a resin composite specimen reproducing the tooth structure. Evaluation of the color differences between the try-in pastes and polymerized cements of the same shade was performed with a spectrophotometer and a visual evaluation by three observers. Results: The measurements showed that for shades of Variolink Veneer and Variolink Esthetic LC resin cements and the corresponding try-in pastes there were significant color differences (ΔE > 2.23). Among the groups of different thicknesses, specimens of 0.5-mm thickness exhibited the highest ΔE values, while the specimens of 2-mm thickness exhibited the lowest. Conclusions: The present study suggests that dentists should not rely on try-in pastes for the final color evaluation because they do not perfectly match the color shade of the cement used for the final luting of ceramic restorations. The originality of this study was the interpretation of color differences utilizing both a scientific spectrophotometer and visual observation. Aim: To optimize the esthetics of ceramic restorations, it is important to determine accurately the effects of various parameters on the final color of the restoration. 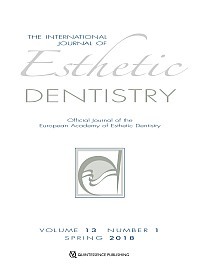 However, there is a lack of information on what determines the color of translucent feldspathic veneers formed using ceramics such as Vita Mark II. The aim of this study was to evaluate the effects of the ceramic layer thickness, cement color, and abutment tooth color on the color of the feldspathic ceramic veneer restoration. Material and methods: A total of 30 all-ceramic monolithic veneers (Vita Mark II) were fabricated using a CAD/CAM system. The crowns were divided into three groups of differing ceramic thickness (0.4-, 0.7-, and 1.0-mm thick). Each type of crown was seated on six different-colored abutment teeth (1M1 [reference], 1M2, 2M2, 3M2, 4M2, and 5M2) using seven different try-in paste colors. The color of the resulting restoration was evaluated using spectrophotometry with a spot-measurement device (Vita Easyshade Advance 4.0). Color data are expressed in CIE L*a*b* system coordinates, and color differences ΔE relative to the reference tooth were calculated and analyzed using one-way analysis of variance (ANOVA) with the Bonferroni post hoc test at α = 0.05. Results: The color difference ΔE of the feldspathic all-ceramic veneer system was significantly affected by the thickness of the ceramic layer, the cement color, and the abutment tooth color (P < 0.05). The smallest values of ΔE compared with the reference color were found when try-in pastes shade -3 was used. As the thickness of the ceramic layer increased, a significant decrease in ΔE was found. As the color of the abutment tooth varied from light to dark, a significant increase was found in ΔE. Conclusion: The thickness of the ceramic layer, the cement color, and the abutment tooth color significantly affected the color of the resulting CAD/CAM feldspathic ceramic veneer restoration.